Capable motion control from a $2 PIC and an $8 PCB? Yep! The higher end PICs that can be installed on the BOB Panel board actually have enough power to provide ultra low cost motion control: Accepting G-Code commands from a PC (via the RLC3 USB adapter) and producing step and direction for several axis CNC Mill, etc... control. Of course, that depends on a PIC wizard like VegiPete writing hand optimized assembly code to run the critical parts. All the standard G-CODE commands are supported, 4 axis, XYZ plus A (or E), rapids, feedrates, etc... With a ESP-8266 Serial to Web interface, the browser interface can add features like remote interface, preview, status display, easy configuration, etc.. Followed by the current configuration (see below) and then the homing sequence if set to automatically home on startup or ;Waiting for Home command. for a more detailed overview of G-CODE. A block is one line of text consisting of one or more "words" where each word consists of a letter and a number. White space is ignored. Lower case is converted to upper. A line of text ends with a CR and/or a LF. A number can be positive or negative and may contain a decimal. A number begins with optional '+' or '-' and ends with any non digit. Extra decimal points are ignored. 12.34.56 = 12.3456 Extra +/- signs restart the number. +12.3-4.5 = -4.5 (The number of decimal digits is specified in the config and excess digits are ignored. X,Y,Z,A recognized axes. X and Y movement is coordiated. 2.5 axis functionality means that if a Z or A axis move appears in a block, it will be acted on before any X and/or Y axis move. G17 XY plane - no effect (default) ONLY XY plane supported. G92 set absolute position of any axes found to zero e.g. G92 X0 sets the X axis position count to zero. % toggle UART echo (default on). Also resets line count on error messages. / block delete - ignore block if block delete is on. ( start of comment - remainder of line ignored. ; start of comment - remainder of line ignored. (MS message - a 16 character string will be echoed. Extra chars ignored. Must start at beginning of line. (CF configuration setup/display. Must be at start of block. Must start at beginning of line. (?? returns current positions, in steps, at end of move, and status. e.g. ";=X1233,Y200,Z0,A0,Relay OFF" Must start at beginning of line. M66 turns of the actual generation of step pulses for testing purposes. M77 turns step pulse generation back on. A,X,Y and Z are the steps per inch for the corresponding axes. Negative values reverse the direction of the axis. D is the acceleration value for all axes. Same units as F. Start with 30 and adjust up until there are problems, then back off for stable operation. B is number of recognized decimal places. Extra decimal digits are ignored with no rounding. For example, if N=3, 3.141592 is treated as 3.141. 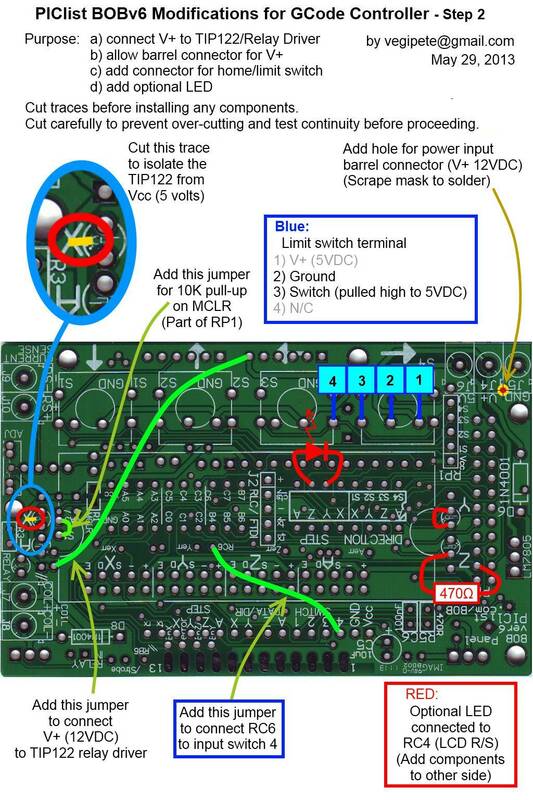 In order to accomodate the reduced number of pins on the PIC vs the Parallel Port on a PC, if your drivers depend on an enable signal from the controller, we have to modify the board to consolidate all the drive enable lines into one signal. Since Z and A are already together, that means cutting the traces that connect X and Y enables and then jumpering them to Z/A. See the info graphic here for those modifications, and the correct installation of R2 (required if you want spindle relay control). If your drivers don't need an enable signal, simply don't connect it at the driver. Socket for U1. A specially programmed PIC18F14K22 chip is available on request. J2 Serial port - bottom mounted, right angle header, for RLC1 serial or RLC3 USB adapter. FTDI cable can be used if pins 1 and 3 are swapped. The E-Stop and Limit switches are Normally Closed switches connect in series. I.E. they are wired as a daisy chain, with the S4 signal from the BOB going to one side of the NC E-STOP switch, then the other side, to one side of the X limit switch, and the other side going to one side of the Y, and so on until the last wire connects back to ground. This means that if a wire breaks, or a connection is lost, the limit won't be missed. Each Limit switch needs a ~4K7 resistor across it's pins, the E-STOP should NOT have this resistor. When a limit is pressed, the line will still show some resistance, which allows the unit to differentiate between limits and e-stop. 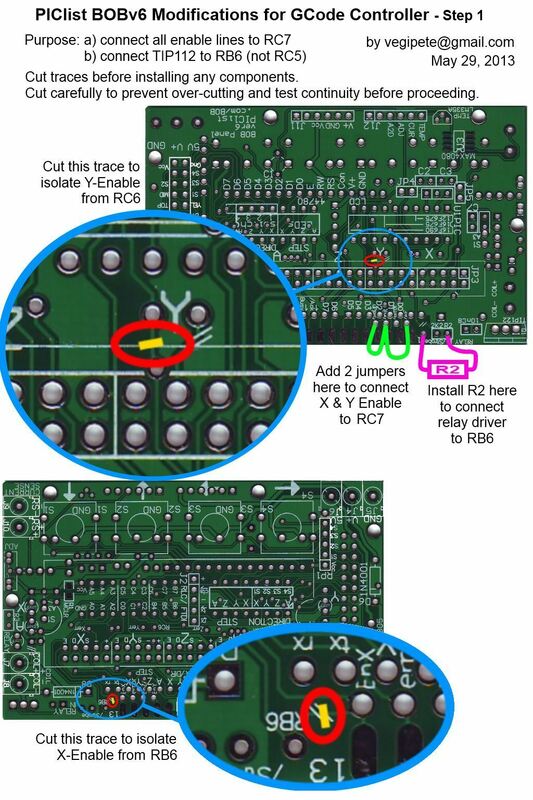 To protect against spindle activation when bootloading new code into the PIC, a 4k7 pull down resistor (from PIC pin end of R2 to ground) can be installed. Or keep the spindle power off! J4-J5 (terminal blocks for power connection) A barrel jack (e.g. CUI Inc p/n PJ-102A) can be installed instead but will require an extra hole drilled in ground plane at the point where J4 and J5 meet as shown in optional modifications. Scrape the solder mask to expose the copper ground layer so you can solder down the tab of the jack. The power and ground pins (pins 1 and 3) are swapped on J2, the serial adapter cable. If you are using an FTDI cable, be sure to swap the pins around in the cable connector before plugging it in.